Soon after the town of Lindsay was established in 1902, several churches had begun Sunday School classes. On July 10, 1903 the Trustees of the Methodist Episcopal Church bought Lot 1 and Lot 2, Block 96 in Lindsay, which are now the Lots on the southwest of Second and Comanche Streets, and built our first church facility. Rev. J.D. Salter was the first pastor. On May 18, 1915 this property was sold to M.M. Smith for $525.00 by the Trustees of the Methodist Episcopal Church, South of Lindsay, Oklahoma. With the oil boom of the 1940s church attendance had grown to such an extent that more room was definitely needed. Several barracks buildings were moved onto the church yard. Growth continued so that in 1951 and 1952, the present Educational Building, containing our kitchen, Fellowship Hall (present Parlor), Pastor�s Study, Secretary�s Office, Nursery, Restrooms and 18 Classrooms, was built. In 1959 all of the existing property of the church had been acquired. The 1913 church building was removed from the property and a new Sanctuary was built at a cost of $97,000.00. The area north of the Sanctuary was later bought and designated as a future parking area. The present parsonage on 204 Southwest 2nd Street was built in 1959. The parsonage has three bedrooms, a living room, den, kitchen and 1 � baths. In the fall of 1990 the estates of Leona Percy and Leta Percy Blundell blessed our church with opportunity to expand facilities. 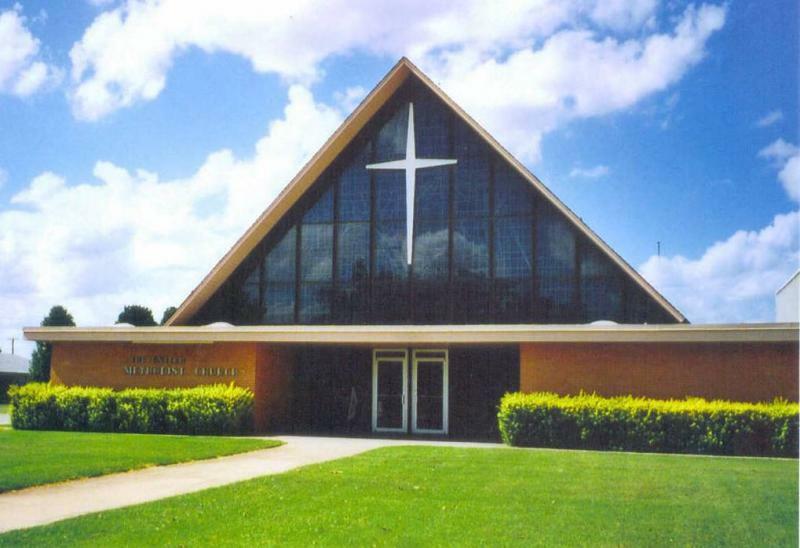 Percy Hall, a large all-purpose fellowship and recreational area (basketball court), new restrooms, a Choir Room (serving also a Sunday School classroom), storage room, an enlarged kitchen with new freezers, ice makers and added storage space was built and completed in the spring 1991. The year 2002 was designated as the Lindsay United Methodist Church Centennial Year in conjunction with the City of Lindsay Centennial Year.